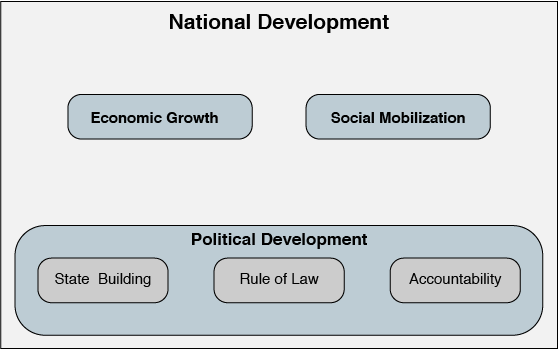 Not long ago I posted notes on Fukuyama’s Origins of Political Order. Here are some quick notes on the first third of his recent book, Political Order and Political Decay. Not all good things go together. Many of the earliest and most effective bureaucratic states have a developmental history of authoritarianism and warfare. 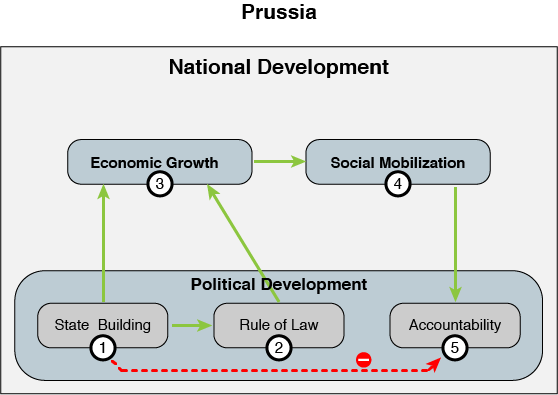 Fukuyama focuses on one of the first “modern states”, Bismarck’s Prussia, once described as “an army with a state.” The State developed first of the three pillars of Political Development, out of existential necessity [Step 1, above]. The supposedly absolute Emperor ruled through an increasingly institutionalized bureaucracy that provided a level of transparency and regularity. The institution of “Rule of Law” was further developed. According to Fukuyama, Prussia is an example of a common [but not inevitable] pattern of modern, nonpatrimonial states evolving out of military competition providing pressure on states to be effective, somewhat meritocratic delegators of complex tasks. Similar patterns can be found in Qin and Han China two millennia before Prussia, and also in Japan and in Europe in Sweden, Denmark, and France. The strong central military-birthed state was not particularly conducive to the institutions of Accountability, as one might expect. Countries that developed democracy before a strong State had a different set of challenges. This summer, I read Henry Kissinger’s Diplomacy. I recently finished his new book, World Order. Both are excellent. Since Kissinger’s project has remained the same for decades, the two books share some content. Between the two, I enjoyed a T-shaped view of Kissinger’s worldview: deeply into Westphalian Europe [Diplomacy] and broadly across the Asian and Middle Eastern systems [World Order]. All of these systems depend upon the interactions of two components: an internal order that constrains possible action by agreement about rules [i.e. “legitimacy”] and an external order of balancing forces that limit the scope and frequency of fundamental challenges to the clashing orders [i.e. a “balance of power”]. Legitimacy is established via cultural apologetic. Even dictators aren’t totally free of constraint. A strong concept of legitimacy does not guarantee a lack of opposition within the borders of a political entity. Balance of power is established the old fashioned way. States strive to address their respective national interests, grouping together to check more powerful aggressors, for example. It is not a guarantee of peace between political entities but is a sort of anti-fragile strategy for avoiding total destruction (by engaging in limited clashes and tests on narrow issues or interests). In World Order, Kissinger summarizes the developmental histories of a few other civs and how he imagines that their preferred understandings of legitimacy influence their past and present decision-making tics. He spends about a quarter of the book respectively on the classic European order, various players in the Middle East, the United States, and various players in Asia. Historically, China often did not recognize itself as in the same category as other nation-states. The Islamic World was organized between themselves and the not-yet-Islamic world. The Persians, somewhat like the Chinese, saw themselves as the pinnacle of civilization on Earth- and the further you get from Persia, the less civilized the people living there. Cosmology and culture inform patterns of behavior that guide nations. In both books, Kissinger also addresses the peculiarities of European and American perspectives on foreign policy. The current recognizable international order based on the nation-state is a particular artifact from particular places and times. The nation-state was not inevitable or final or universal. Not only are there new contenders for hegemony, but there are wholly alternative World Orders fighting to undermine the current system. I never wrote proper notes on Fukuyama’s Origins of Political Order when I first read it. I recently started the new volume, Political Order and Political Decay. The introduction to the second entry provided a great high-level reintroduction to the first, so I thought I’d put it down for the record. Natural Human Sociability is built on 1) kin selection and 2) reciprocal altruism. These habits build reliable social patterns: band-level societies. Ten thousand years ago, the first major institutional transition occurred from band-level societies to larger “tribe-level societies” organized around a belief in the power of dead ancestors or unborn descendants, which expands the definition of family and thus the umbrella of empathy and privilege. Later (roughly 8000 yrs ago) came the State, an institution monopolizing force. Following Max Weber, Fukuyama recognizes two flavors of state: the “Patrimonial State”, treating a defined territory or constituency as under the ownership of the ruler, and the more recently invented “Modern State”, which is ideally impersonal and blind to the polity’s relationship with the ruler. De-patrimonializing the state is difficult and requires some institutional innovation (e.g. military pressure to tax and provision, moving in out-of-region administrators, disallowing advisors from having families). In the contemporary world, the classic patrimonial attitude is more difficult to establish, and so modern tyrants dress themselves in the trappings of public administration (“neopatrimonialism”). Rule-of-Law: Rules binding the entire population, including elites and state power. This is distinct from “Rule By Law”, which is issued by a ruler but does not bind the ruler. “substantive” accountability, actual responsiveness to the needs of the constituents. Fukuyama is interested in the balance and timing of the development of these institutions, and how to “get to Denmark”, an idealized impersonal state that is competent and responsive to its citizens. More notes as I get around to it. I recently finished Kissinger’s “World Order” and might put some words down as well.